To view 11 more pictures, interactive maps and the full, detailed description of the Brabble Shores community, please Login. 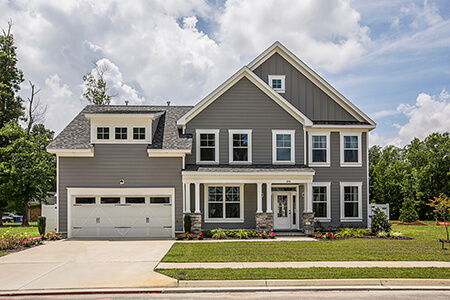 Brabble Shores is a Chesapeake real estate development where each new construction home impresses. Value and quality go hand in hand in each of the properties available here. Located in a section of town that is convenient to other parts of Hampton Roads, VA, this community can appeal to buyers looking for a comfortable place to live. Nearby military bases include Norfolk Naval Shipyard, U.S. Coast Guard Finance Center and Naval Medical Center Portsmouth. New construction real estate is not always as well-equipped as houses in this neighborhood. Each home in Brabble Shores may feature brick skirting, front porch, back patio, exterior lighting, tray ceilings, crown molding, recessed lighting, granite countertops, fireplace, hardwood flooring, kitchen pantry, ceiling fans, professional landscaping complete with sodded yard and more. Life in this part of coastal Virginia offers many opportunities for fun, employment and recreation. There are several industries and companies that make their home base in Chesapeake. Soccer fields, tennis courts, golf courses, swimming pools and fitness trails abound. Residents can easily stay active when they live in this city. Find yummy eateries, theaters and even an indoor trampoline park here as well. When looking in the Hampton Roads real estate market for a home of your own, consider new construction community, Brabble Shores. Send me more information about the Brabble Shores new home community. Our agents gladly offer FREE property tours of Brabble Shores, Chesapeake and homebuyer consultations to all serious buyers.